Ok, so in the end I raised my rating, so overall I rated it as a 5/5 on Amazon and Goodreads, just like the previous books in this series. When I was 75% of my way through I was adamant that I was only giving book #5 a 4/5 because at the time it did not quite meet the high expectations I now have from Cassandra Clare. Regardless, the ending was brilliant and so I have upped my rating- thanks Cassandra, otherwise I would have felt very, very guilty! In Book five there is a huge search led by the Clave for Jace and Sebastian. Unlike the lightwoods, Clary's family and Simon, the Clave's priority is to capture and kill Sebastian, as opposed to looking for Jace, who to them is just another Shadowhunter. However, after several weeks of searching the Clave deprioritises the search as they believe Sebastian cannot be found and Jace is dead. Nevertheless, Jace's family do not lose hope as they continue to search for Jace, in the hope that he is ok. 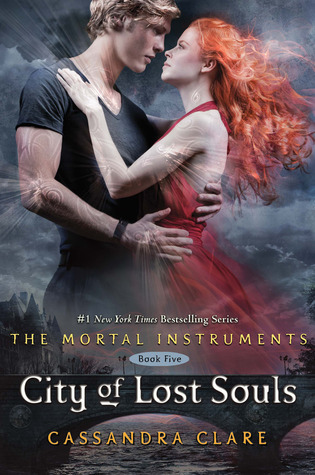 In this book I actually began to dislike Jace. How could he be so friendly with Sebastian, knowing what he did, and that he killed Max? And how could Clary be so stupidly blind in thinking he is still the Jace she knew and that somehow he could be saved? Infact , I even fell into the trap of sympathising with Sebastian of all people. Shocking, I know, but it actually seemed like he had changed and that there was some humanity left in him. After all, Jace did give him his blood so it seemed logical, in a twisted and bizarre way. Sort of. Needless to say I was wrong and Jace wasn't the bad guy after all. Sorry Jace! There wasn't as much sarcastic humour in this book, probably because everyone was under so much stress all the time, what with Clary disappearing and Simon raising Raziel! I am hoping that the next instalment has a bit more humour in there, I missed the Clary-Simon-Jace conversations. It was nice to see Isabelle realising how much she cared for Simon, and Jordan and Maia resolving their differences too. Unfortunately, Alec and Magnus did not have the same luck. Their relationship deteriorated because of Alec's insecurities, and it does not help that Magnus has had countless relationships and is immortal. Alec did not help things by regularly consulting Magnus' ex and coming very close to a very silly decision. I did feel sorry for Alec at the end, but I could understand why he didn't feel like he was enough. I hope things get better for him going forwards, he is a sweety at heart. Now that I have finished the Mortal Instruments series I intend to read the Infernal Devices series by Cassandra Clare, and then the Bane Chronicles also by Cassandra Clare. Not that I'm obsessed or anything... Hopefully, by that time the City of Bones movie will be released! "That never matters," said Alec. "Not when you blame yourself." "I'm not related to them," Clary said. "I don't have any brothers or sisters." "None?" Disbelief registered in the boy's tone, as if she'd told him she had webbed feet. "Is that why you look so sad?" Clary thought of Sebastian, with his ice-white hair and black eyes. If only, she though. If only I didn't have a brother, none of this would have happened. A little throb of hatred went through her, warming her icy blood. "Yes," she said softly. "That's why I'm sad." "Perhaps I did," said the Queen, admiring her shimmering toenails. "I've noticed the Fair Folk often say 'perhaps' when there is a truth they want to hide," Clary said. "It keeps you from having to give a straight answer." "Perhaps so," said the Queen with an amused smile. "'Mayhap' is a good word too," Alec suggested. "I see nothing wrong with 'maybe,'" said Simon. "A little modern, but the gist of the idea comes across." "So, do you mind if I ask you something? It's personal but important." A note of wariness crept into his voice. "What is it?" "With the whole Mark of Cain thing, does that mean if I accidentally kick you during the night, I get kicked in the shins seven times by an invisible force?" That was the problem with knowing someone so well, she thought. It was very hard to pretend around them, or to ignore it when they were pretending, even when it would be easier. "'Valentine's son,'" he said. "Is that really how you think of me? Under other circumstances you could have been my godfather." "Under other circumstances," said Luke, sliding his finger onto the trigger, "you could have been human." Sebastian stopped in his tracks. "The same could be said of you, werewolf." For as is often the happenstance with that which is precious and lost, when you find him again, he may well not be quite as you left him. "There may already be no chance," said Jocelyn. "God, Clary, look at the evidence. You thought you and Jace were brother and sister! You sacrificed everything to save his life, and a Greater Demon used him to get to you! When are you going to face the fact that the two of you are not meant to be together?" He looked at her warily and took a sip from his mug. "Weren't that what?" He groaned "I was afraid of that." "My plans are not terrible." "Isabelle's plans are terrible." He pointed a finger at her. "Your plans are suicidal. At best." "I would pluck out my own eyes with a fork before I would give away your secrets," Simon said, then looked anxious. "Wait a second. Do you think that's likely to be required?" "I'd do almost anything for you," Simon said quietly. "I'd die for you. You know that. But would I kill someone else, someone innocent? What about a lot of innocent lives? What about the whole world? Is it really love to tell someone that if it came down to picking between them and every other life on the planet, you'd pick them? Is that-I don't know, is that a moral sort of love at all?" "There are some people-people the universe seems to have singled out for special destinies. Special favours and special torments God knows we're all drawn towards what's beautiful and broken; I have been, but some people cannot be fixed. Or if they can be, it's only by love and sacrifice so great that it destroys the giver." But it felt like touching only the edge of happiness; every time she looked at Jace, happiness slipped away from her. How could he be Jace and not-Jace, all at once? How could you be heartbroken and happy at the same time? "What have you done to my cat?" Magnus demanded, returning to the living room carrying a pot of coffee, with a circle of mugs gloating around his head like a model of the planets rotating around the sun. "You drank his blood, didn't you? You said you weren't hungry!" Simon was indignant. "I did not drink his blood. He is fine!" He poked the Chairman in the stomach. The cat yawned. "Second, you asked me if I was hungry when you were ordering pizza, so I said no, because I can't eat pizza. I was being polite." "That doesn't give you the right to eat my cat." "Can it tell the future? So, pentagram, is our band going to make it big?" "It's a demon from Hell, not a Magic Eight Ball, Jordan," said Magnus irritably. "Thanks for coming here with me," he said finally, having racked his brain for something meaningful to say; they seemed to be expecting it. He wasn't the sort who made big farewell speeches or bid people dramatic good-byes. He looked at Alec first. "Um, Alec. I always liked you better than I liked Jace." He turned to Magnus. "Magnus, I wish I had the nerve to wear the kind of pants you do." "I know," Izzy snapped. "I mean more dead than usual." Alec shot her an incredulous look as he stepped out into the entryway. "Everything's going to hell in a handbasket, and you want to know about my relationship with Magnus?" "You know men. We have delicate egos." "I wouldn't describe Jace's ego as delicate." "No, Jace's is sort of the antiaircraft artillery tank of male egos," Simon admitted. There are memories that time does not erase, Clarissa. Ask you friend Magnus Bane, if you do not believe me. Forever does not make loss forgettable, only bearable. "How could I protect you if you wouldn't let me?" He leaned forward. "That, by the way, is a rhetorical question." "Good. Because I don't need protecting." "I knew you'd say that. But the thing is, sometimes you do. And sometimes I do. We're meant to protect each other, but not from everything. Not from the truth. That's what it means to love someone but let them be themselves." Clary wondered. She had seen Sebastian looking at Jace, even at herself, and knew there was some part of him as echoingly lonely as the blackest void of space Loneliness drove him as much as a desired for power-loneliness and a need to be loved without any corresponding understanding that love was something you earned.